I was intrigued by "Mr Danger Pant's" fat tired Firefly when I first saw it 5 years ago on MTBreview forum. 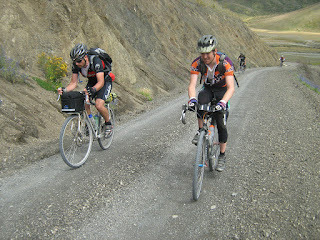 It had some very interesting kit on it including WTB dirt drop-bars. I always thought it would be cool to build something like this. Its a 26 incher with Schwable Super Motos. More recently the guys at Firefly built an All-road/rando styled bike that they thought might appeal to hard-core-randonneur Jan Heine. They got mostly high praise from Jan who tested it while touring in Mexico. 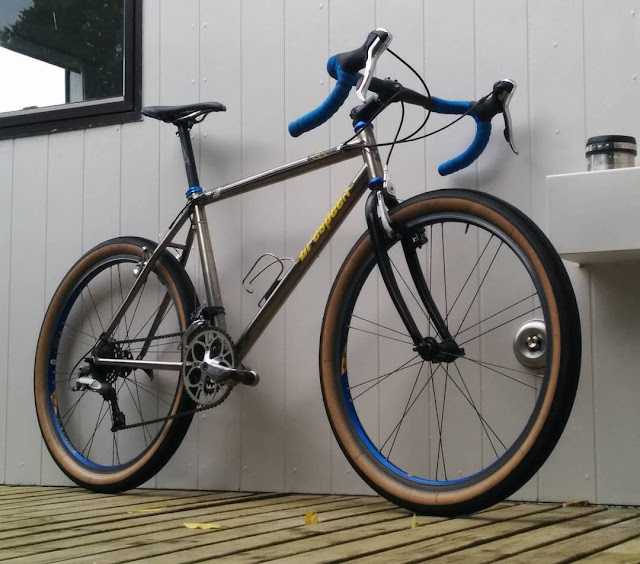 Its a beautiful bike, and has motivated me to convert my old titanium Litespeed 26er into a light-weight drop-barred do everything bike. 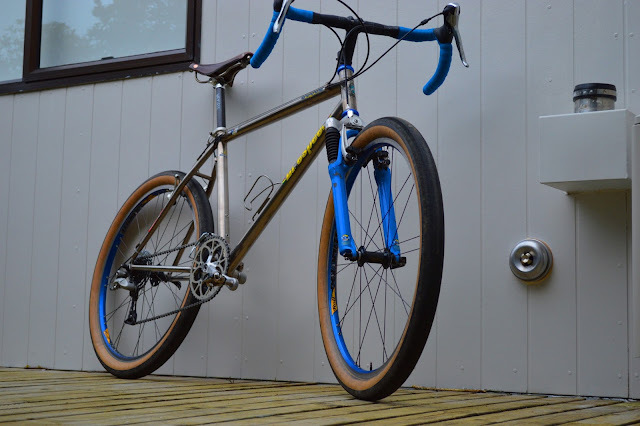 While you have always been able to get big heavy fat slick tires for 26ers you can now get some more light weight ones, and also 27.5 (650b) slick tires in wider widths are starting to appear. The Compass Rat Trap Pass 26 inch tire is listed at 2.3 inches and 418 grams in its lightest format. I will try these on my repurposed Litespeed Ocoee and see how they roll. I am not keen to try the lightest tires on our crappy roads but will settle for the 454 gram version. 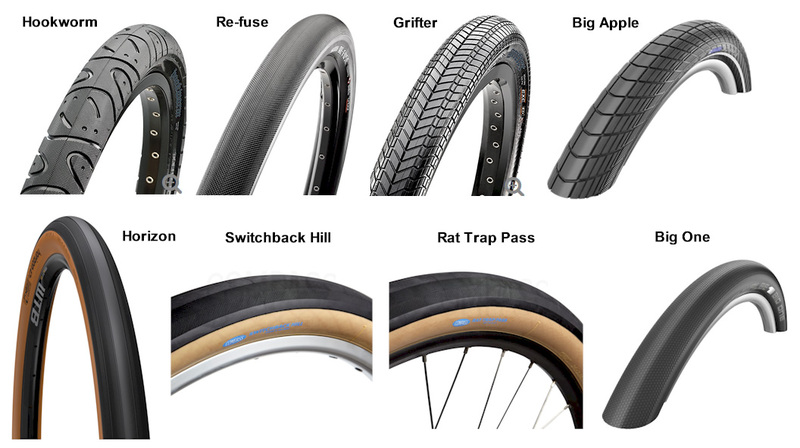 See below a list of the tires I dredged up for a potential tourer or commuter. Some are heavy, some are light, some are fast and supple. Most of the 27.5 ones are not that wide but I am sure there are more coming. Some tires I haven't listed here are the Stans tires but they are verging into semi slicks and there are a whole lot more tires in that field. 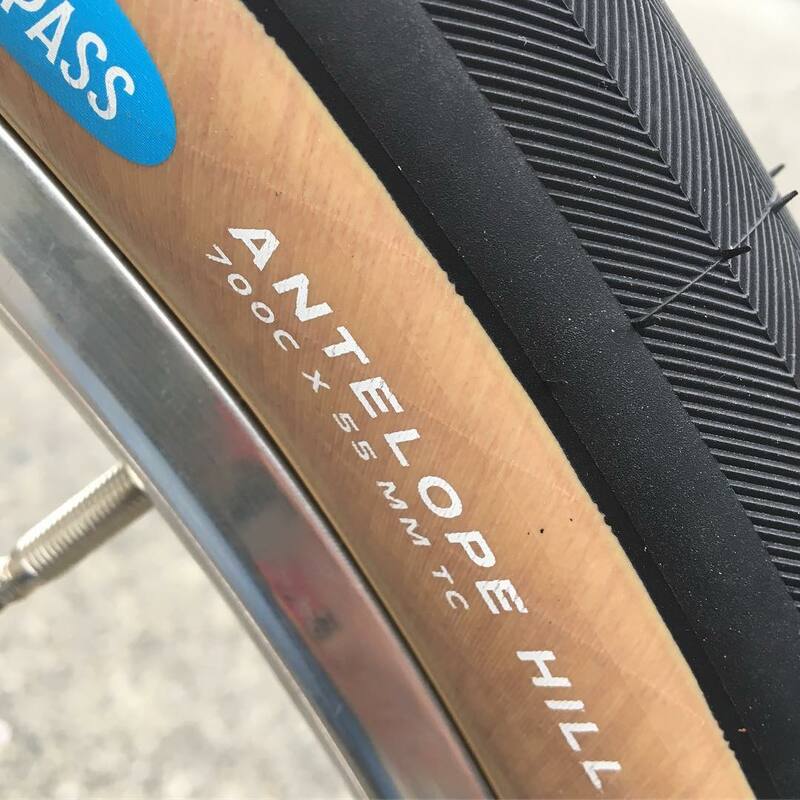 You might even class some of these tires below as semi-slicks. This site is pretty interesting if you believe in rolling resistance values as measured in the lab. They rate the Schwable Big one as the fastest MTB tire they have ever tested. 07/05/2018 - Some updates ! Schwalbe Kojak: 2 inches wide. Schwable Marathon Supreme: 2 inches wide. Panaracer RibMo 2 inches wide. 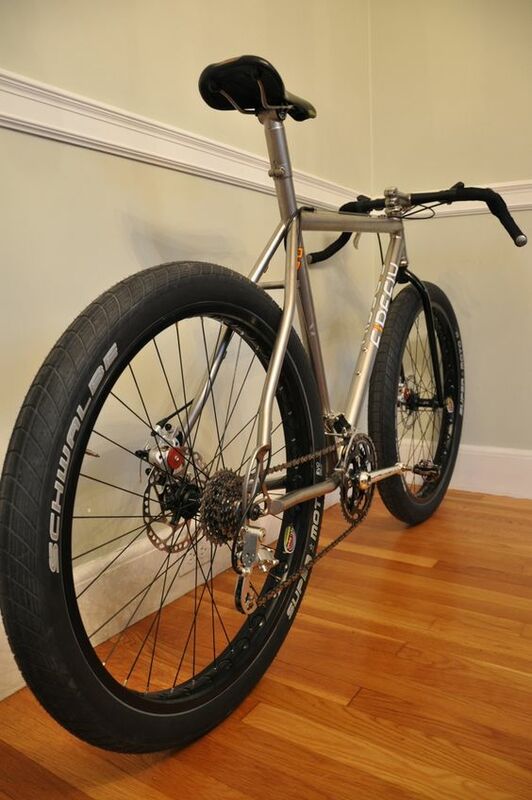 A few fatter slicker tires. First draft for the new "format". Tires and fork on the way. Update: So far, so good. One ride in. 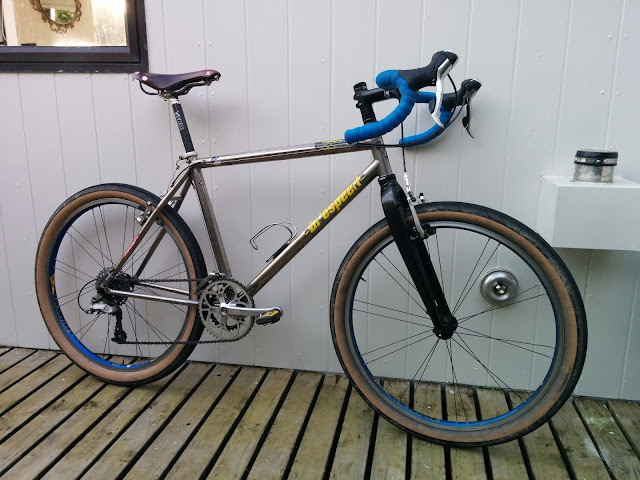 Very fast, and beautiful on gravel at 30psi. 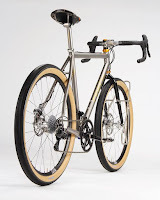 Not sure whether to go with a period steel Spinner fork, or go with a disc or vees on an alloy Mosso. Dropped the granny, and swapped out the 42 for a 46. with an 11-34 on the back. It should cope with most things. 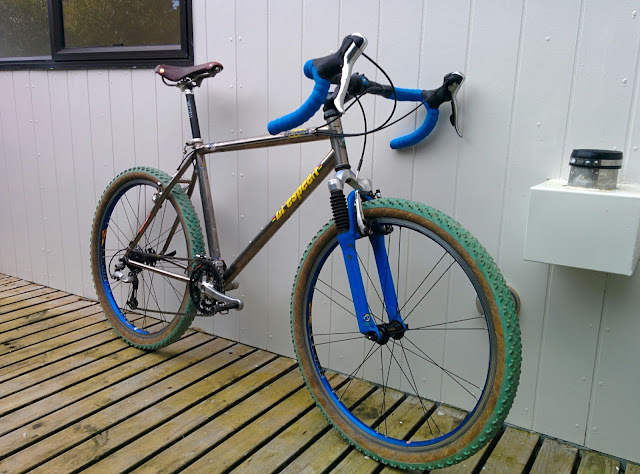 I have heard that a deore front deralier can work with 3 speed road shifters, this medium old XTR one is certainly not coping with it. I dont really want to go bar end. Back with the 96 SID on. Ok, now working in all three cogs with a new "Shimano Deore M591 10-speed Front Road Derailleur", whatever that means..... Heaps of clicks in the 3 speed shifters for trimming. Spinner fork on front, still need more steerer. So much fun to ride. Good list and in fact something I'd been looking at recently - I ended up going with the DTH. Was worried that going with a BMX race tyre would be asking for trouble with wear or punctures. They're now rolling on just over 2000km now and they're still looking in pretty good condition. Wow HYG, that is one hot looking rig. The Freeload/Thule racks are 100% bomb-proof eh. I love seeing peoples creative solutions. So much more fun than off the rack stuff. 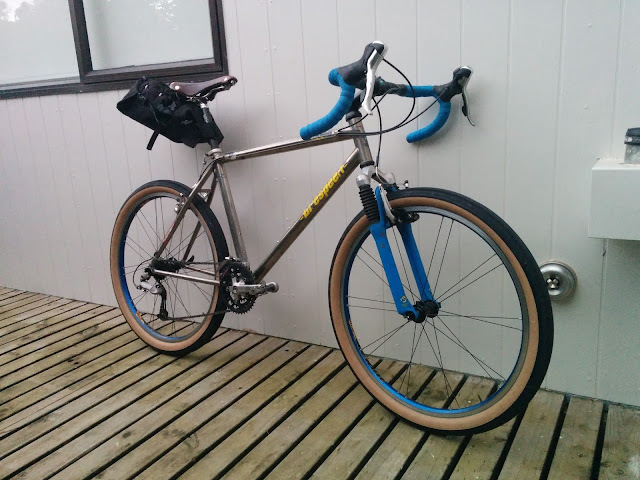 A lovely Jamis too. Awesome. Thanks :) The Freeload is actually starting to develop a few rattles and squeaks now, but still seems to be working just fine. It's had a pretty long hard life though, so I can't really complain. What is the size of your Dth? 2.15 or 2.3?